Viewers do not worry much about violence on television, to judge by a BBC report. It is written by Mr Brian Emmett, head of BBC audience research, and Professor Elihu Katz, director of the Communications Institute in the Hebrew University of Jerusalem. Although 57 per cent thought there was too much violence only 18 per cent actually perceived violence in particular target programmes. The authors say that possibly the amount of violence h a d affected, the viewers' threshold of tolerance that viewers had in a way been " saturated." There was a marked difference in reactions to plays and to serials. People were more disturbed by violence because plays were less stylised, closer to life and contemporary society, and less certain in their' endings. The	report, " Violence on Television " was commissioned two years ago. Part one deals with research into the incidence and type of violence, and part two with viewers' attitudes.
" It could be a mistake to try to read into this report that those who criticise television for showing too much violence are justified, or that there is no cause for concern." the authors say. Although much violence had little significance for most viewers "it does not imply that such portrayals are harmless." Nearly half the violent incidents occur in news and current affairs, programmes, but most are described, not shown, says the report. It names the top 10 violent programmes as : Mannix ; The Untouchables ; The Baron ; The Avengers ; I Spy ; Dr Who ; Hawaii Five-0 ; The Virginian ; Callan ; and Star Trek. APA 6th ed. : Pritchett, Oliver (1972-01-27). TV violence 'discounted'. The Guardian p. 22. MLA 7th ed. : Pritchett, Oliver. 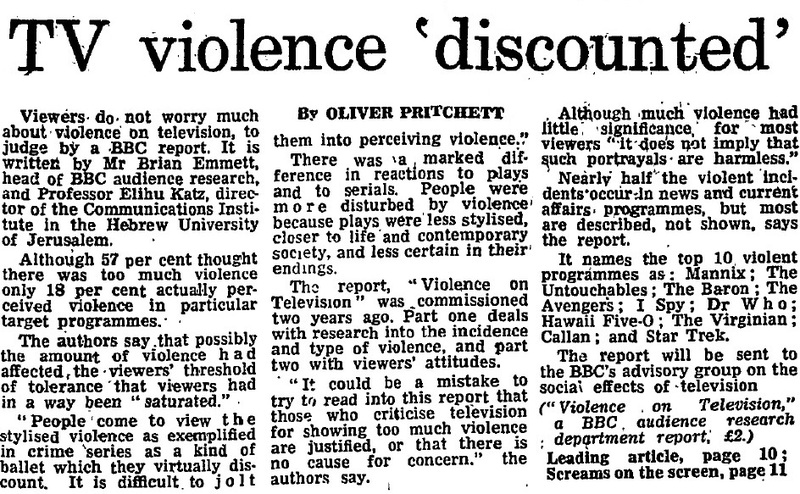 "TV violence 'discounted'." The Guardian [add city] 1972-01-27, 22. Print. Turabian: Pritchett, Oliver. "TV violence 'discounted'." The Guardian, 1972-01-27, section, 22 edition. This page was last modified on 12 August 2014, at 02:05.